The pressure of being Tristan Thompson may have finally gotten to Tristan Thompson. Toward the very end of Game One of the NBA Finals on Thursday night, the power forward and controversial baby daddy lunghed to block Shaun Livingston's shot. The referees believed Thompson hit Livingston in the face with an elbow and promptly ejected Tristan from the game. 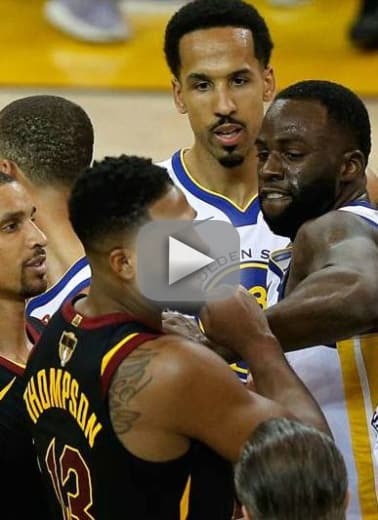 From there, Draymond Green of the Warriors clapped in Thompson's face and sort of taunted Khloe Kardashian's much-maligned boyfriend, which led to Thompson shoving Green in the face. He may be suspended for Game Two, which would be a major blow to Cleveland. In response to the incident, which has gone viral, many social media users are speculating over just what words were exchanged Thompson and Green. Most, of course, assumed the ballers had to be fighting about Khloe. Or maybe about Drake and his latest scandal. Tristan Thompson was ejected because the ref was mad he cheated on Khloe, and Draymond told Thompson he made sure Khloe was taken care of. The status of Thompson and Kardashian remains a mystery, of course. Last we heard, Khloe was still living in Cleveland and was angry that strangers online dared to offer advice about her love life. It seems as if she really may give Thompson another chance, likely for the sake of their daughter, True, and her future. It is better to grow up in a two-parent household than a one-parent household, right? We're not about to judge her decision, either way. We really can't imagine what she's been going through this entire time. But we are about to laugh Thompson for this nonsense, which he says started because Livingston dared to shoot the ball when the game was already decided. Bella Thorne: Charlie Puth is Just Butthurt! Next story Javi Marroquin: The Best Reactions to His Big Baby News! Previous story Bobby Brown: I’d Like to Slap the S–t Out of Kanye West!